A high potential performer, sometimes referred to as an emerging leader, is a talented and driven individual who has the attitude and capacity to be successful in a leadership role. With the right support, high potentials can form a strong bench of leaders for your organization. In this video, Liz Poeschl, Business Development Manager at FOCUS Training, discusses ways to foster the growth of high potential leaders and ways to retain and motivate them in your organization. To learn more about how FOCUS can help you build your leadership pipeline, contact us today. Coaching is about more than patting someone on the back or providing a long list of improvements. Coaching is about striking the balance between reinforcing praise and pushing your coachee to develop and grow. In this video, Alyssa Chang, a FOCUS Training facilitator, shares her personal experiences with coaching and being coached. FOCUS Training can prepare your leaders and managers to give more effective feedback and equip them for critical conversations. Our live training combines experiential learning and tactical practice to build confidence and comfort in performance conversations. Leadership Matters. To learn more about how FOCUS can help improve your leadership pipeline, contact us today. Talent management and performance management are terms you may hear used interchangeably in the human resources field. In reality, these concepts have very different functions and results, both short and long term. Talent management refers to the way organizations prepare and keep employees with the company. This may include developing staff for future leadership positions, increasing employee engagement or preparing for future growth. At an individual level, talent management provides opportunities for leadership to deliver stretch assignments that take an employee beyond the typical scope of their job. Conversely, performance management measures the effectiveness of an individual or group as it relates to the overarching goals of an organization. In many organizations, an annual performance review is utilized as a tool to reflect on an individual’s contribution throughout the year in accordance with their job description and expected functions. The results of an annual performance review is commonly used as a way to divvy out merit increases. In an ideal setting, talent and performance management functions are tied closely together. These conversations should not be a once a year occurrence, but rather something that is incorporated into daily work. Doing so will keep both individual and organization goals in the forefront of every employee’s mind and drive business results. Join Us for Our Next Talent Summit on November 9th! Don't miss our last Talent Summit of the season on Friday, November 9th! IT Manager Sean Geeleher will present on Agile Leadership. The summit will be held from 8:15 - 10:30 AM at the Peanut Butter & Jelly Deli. Join HR and Talent professionals from around the area to share ideas and tools for developing and supporting talent within your organizations. Interested in learning more on what happens at a Talent Summit? Watch the video above. Coffee and build-your-own PB&J bar will be provided. Register for the event here. Performance management and talent management are often interchangeable terms in business. Performance management is a reflection of current of an employee's current performance whereas talent management focuses on future potential. Some organizations choose to keep these conversations separate and distinct, particularly during instances where merit increases are involved. Others opt to integrate these conversations, combining wins and opportunities with a forward-thinking mindset. In our latest video, Matt Meuleners of FOCUS Training defines the differences between performance and potential, and discusses strategies and tools on how to define talent within your organization. What’s Your Ruler for Employee Engagement? Did you know only 13% of employees are actively engaged in the workplace? * It can be easy for an organization to say they want to “increase employee engagement,” but difficult to define what exactly that means. Use these three steps to guide your decision making and hone in on your definition of employee engagement. Define what being “engaged” looks like in your organization. Is your definition of engagement metric or productivity-based? Is it a pulse from your leaders on the general appearance of happiness amongst a group or an individual? A low total of sick calls? You may have a combination of factors that make up your ideal, engaged employee. That’s okay! Ensure there is a definition to minimize interpretation in an organization. Decide on a measurement process. Many organizations do an annual employee engagement survey. Others have “pulse checks” with staff at regular intervals throughout the year. Whichever method you use to measure engagement, make sure that staff engagement is not a time of year but rather an ongoing conversation. If teams only hear about the importance of staff engagement when the survey approaches, it will make the build-up feel disingenuous. Create a plan for long-term engagement. Having engaged staff right now is great; having engaged staff long term is even better. It's important to start the conversation about retention and re-engagement amongst all levels of your organization, not just at the leadership level. If you have a high-performing staff member, talk about their future and advancement within the organization. Encourage open dialogue and development pathways. Not every high performer wants to move into a formalized leadership position and others might want to explore other roles to diversify their background. Consider job shadowing or rotational programs and prepare staff for future growth by offering developmental programs. Remember, engagement isn’t just at the staff level. Offer your existing leadership team ways to continue their growth and development, which will further entice them to “pay it forward” to their teams. Implementing these strategies will allow you to measure your employee’s engagement on a regular basis. Your bottom line will thank you. An engaged employee is 87% less likely to leave your organization, and replacing an employee can cost up to 150% of their annual salary. Poll your team, find out what drives them to do their best work and stick to it! In our latest podcast episode, Liz Poeschl of FOCUS Training speaks with Meg Daly to discuss the upcoming Talent Summit on "Practical Solutions to Move from Managing to Leading." This quick preview is an excerpt from the full episode coming soon. Join us for our next Talent Summit on this topic happening on Friday, September 14th at Cudahy Tower (925 E. Wells Street). Coffee and light breakfast will be provided. On July 13th, FOCUS Training held their latest Talent Summit hosted at and presented by GMR Marketing on the topic, "Talent Elevated: Getting a Seat at the Table." Talent and HR professionals from around the area joined to hear Janine Pulvermacher and Dana Ernst share their experience with a challenge that many in the HR and Talent world face - making the talent review process more efficient and effective. From the comfortably cool space of their Barcade, Janine and Dana described the culture developed within GMR. When the organization and individuals are so heavily focused on large projects such as the Super Bowl or the Olympics, how can leaders remember the individual contributions their employees made during those events when their annual review might not happen for another two, five or even ten months? Instead, a flip on the model was proposed to give leaders the ability to provide more real-time rewards and incentives for the amazing work their teams were doing. GMR focuses on "progress, not perfection," and embraces microcultures within teams to make the process fit for them. By providing more scheduled, real-time feedback through one-on-ones with employees and leaders, they keep teams on track and individuals engaged. Watch the video above to learn more about what takes place during a FOCUS Talent Summit! Are you doing something interesting within HR or Talent in your organization? Do you have a problem/project you're working on and want to lead a discussion for intelligent, experienced individuals to chime in on? Be the guest presenter at an upcoming summit! Not interested in presenting but have a great space you want to show off? Be a host! Will you join us for our next Talent Summit on Friday, September 14? Consultant Meg Daly will present on, "Authentic Leadership Super Powers: Practical Solutions to move from Managing to Leading." We hope to see you there!Be sure to register for the event here. Last week, the sixth cohort of the Accelerate Institute graduated! The twenty-four graduates represented thirteen different organizations and numerous industries including architecture, manufacturing, hospitality, food/beverage, finance, and non-profits. Their eclectic industry and personal backgrounds led to robust conversations and allowed participants to build strong relationships in an open and inclusive environment. Joe Montemurro of MillerCoors and Megan Walker of Eppstein Uhen Architects were our graduation speakers. They took the time to share their experience participating in the Accelerate Institute and the ways they have incorporated new skills into their daily work and personal life- including how to use motivation theory tactics to convince a small child to eat what's on their plate. Watch the video above for highlights of the event, including testimonials from a participant and their supervisor. Learn more about the Institute and see if it's a fit here or contact info@focustraining.com today! Employee Engagement is more than a yearly survey for your staff. It is about establishing a culture in which employees feel willing and able to do their best work on a given day. Leaders have an opportunity to connect with their teams on a personal level and in ways that do not have to take them away from their daily tasks. In our latest video, Betsy Barnich of FOCUS Training discusses ways leaders can incorporate engagement strategies of all sizes into daily practice. Consider- what works well for your team? What can you do to engage - or re-engage - members of your team and support great work? The SARAH change curve highlights the stages most people will go through while adapting to change: Shock, Anger, Rejection, Acceptance, and Health. Understand your own reaction to change. Many have likely heard the much-referenced statistic from McKinsey and Company that 70% of organizational change initiatives fail. While startling at first, upon further reflection, many employees have no trouble remembering projects they took part of that just… fizzled away. How much of that falls to the company and how much of that falls to us as individuals? We will inevitably reach points in our careers where we need to champion a change initiative that we don’t fully support. What do you do in those moments? Do you complete tasks assigned to you and stay out of the rest? Do you get a seat at the table and bring up your thoughts and challenges? If you shirk back, it’s okay. Recognize your triggers and step up to ask questions to ensure a successful implementation. Provide forums to share updates within your team. This may be a weekly team meeting, a daily huddle or during one-on-one conversations with individual employees. Are things status quo or is there an event on the horizon to inform a team before it lands on their laps as “the next big project” to drop everything and work on? Often, leaders don’t communicate the possibility of change because they don’t want to create a distraction or make people nervous. Provide enough time for people to react to a change or voice thoughts during a planning process that can derail a project if brought up too late. As a leader, it is important to share your thoughts about the change with your team. When you first heard about it, did you think of potential roadblocks? What about the downstream benefits? It helps the team to know thoughtful planning took place. The message shouldn’t be given as “I’m not happy about this, but we have to do it anyways,” rather “here are some potential challenges I see and here are some of the ways we can work to get through them.” Honesty will bring the team together and encourage feedback to create best practices. Everybody has different emotions regarding change. Some embrace it, some shy away and others might be angry. Most everybody will think about what this means for them and what they are giving up. Provide people with space to retreat temporarily from the change process and come back reinvigorated to move forward. In the end, it comes to our own empowerment as leaders to keep a change process top of mind until it becomes an established habit. With consistent reinforcement, teams will push through the awkward phase of change and will be less likely to revert back to the old process. This reinforcement should not fall solely on your shoulders- engage your process champions to promote the work and reinforce their own engagement. Missed the summit but still interested in learning more about conflict resolution? Listen to the full-version of our podcast episode with Matt Meuleners and Kaitlin Henze on this topic. Join us for the next summit on May 11th! Curt May of Axa Advisors will be our guest presenter. Join HR and Talent Professionals from around the area to share ideas and tools for developing and supporting talent within your organizations. Register for the event here. Grow networks: the relationships established in the Institute give your learners access to different industry perspectives and best practices from a diverse group of leaders. Connect concepts: learners build on concepts throughout the cohort to develop a deeper understanding of the interdependent skill sets leaders need to succeed in a complex work environment. Peer support: cohorts enable learners to give and receive peer coaching and feedback throughout the experience, empowering your leaders to apply these skills at work. Interested in being a part of the Elevate Institute? Registration is now open. AJ Watson, National Director of B.A.M. and FOCUS Training facilitator, shares some perspective on the mindset required to effectively lead organizations through change. In this video, AJ shares the importance of recognizing and assessing the marketplace as a leader. Change leadership will be a key learning objective in the Elevate Institute. Contact us today to find out if you are the right fit. FOCUS Training Welcomes Liz Poeschl! We are excited to announce that we have added a new member to the FOCUS Training team! Meet Liz Poeschl, who will be our new Business Development Manager. 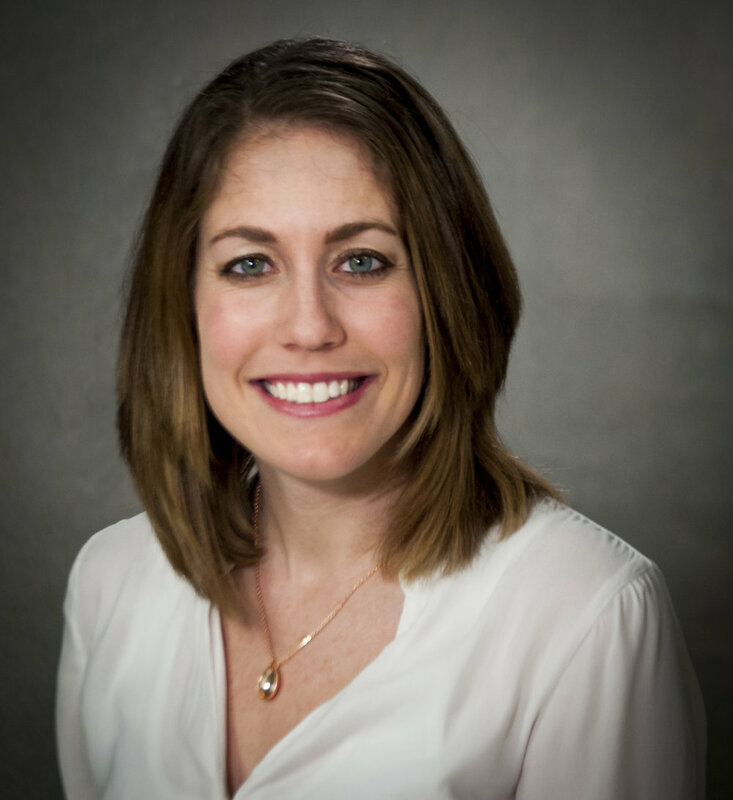 Liz joins the team from Froedtert Health, where she spent eight years in a variety of roles, from project management and clinic implementation to training and development for physicians, leaders, and staff. Liz graduated with a degree in Health Care Administration and Business from UW-Milwaukee and has her Masters of Business Administration from the University of Colorado-Denver. In her new role, Liz will work to grow and enhance FOCUS Training’s professional market by providing training solutions to new and existing clients. She will also play a large part in launching FOCUS Training’s new Elevate Institute, a program designed to position skilled managers for director roles by equipping them with strategic leadership skills. In our latest podcast episode, Matt Meuleners of FOCUS Training speaks with Kaitlin Henze of EmPowerHR to discuss the upcoming HR & Talent Summit on Conflict Resolution. This quick preview is an excerpt from the full podcast coming soon. Join us for our next HR & Talent Summit on this topic happening on Friday, March 16th at Colectivo Coffee (2211 N. Prospect Ave). Coffee and light breakfast will be provided. Register for the event here. Build your leadership credentials with FOCUS Training's Elevate Institute. This course is ideal for emerging leaders to advance their career into senior management. Participants build a strong network of professionals in the regional business community and develop strategic leadership skills. Missed the summit but still interested in learning more about diversity in candidate sourcing? Listen to our latest podcast on this topic. Matt Meuleners sat down with Guillermo Gutierrez, Senior Talent Development Consultant at R. W. Baird, to discuss diversity in the context of unconscious and conscious bias, how we define diversity, and other related topics. Join us for the next summit! Conflict Resolution will be the topic of our Talent Summit session happening on Friday, March 16th. Join HR and Talent Professionals from around the area to share ideas and tools for developing and supporting talent within your organizations. Register for the event here. In preparation for our next HR Summit on diversity and inclusion in hiring practices, Matt Meuleners sat down with guest presenter Amy Krenzke to learn more about what she will discuss in depth at the summit. During this mini podcast, Matt and Amy discuss topics such as finding diverse talent, tackling the unconscious bias, and writing job descriptions that meet the needs of diverse candidates. Take three minutes to check this out! Want to keep the conversation going on diversity in candidate sourcing? Join us for our next HR Summit on this topic on January 19th. Register for the summit here. In our first mini podcast episode, Matt Meuleners of FOCUS Training discusses tips for leading change in a restricted environment. Difficulties in communication can occur while leading change in a restricted environment, but there are ways to help employees deal with the emotional weight of uncertain situations. Click above to listen and learn about the differences between ambiguity and uncertainty, and why it's important to differentiate the two as a leader. To learn more about Change Leadership, join us for our next HR Summit on November 10th. Wendy Butler, Director of Organizational Development at Marquette University, will be our guest presenter. Click here to register for the event.